Your family will not be disappointed with your accommodations at Bluewater Keyes in the Crescent Beach section of North Myrtle Beach, South Carolina. Featuring two pool decks, easy beach access, fitness center, convenient parking garage and incredible North Myrtle Beach vacation rentals, this North Myrtle Beach resort is ready to host your family! 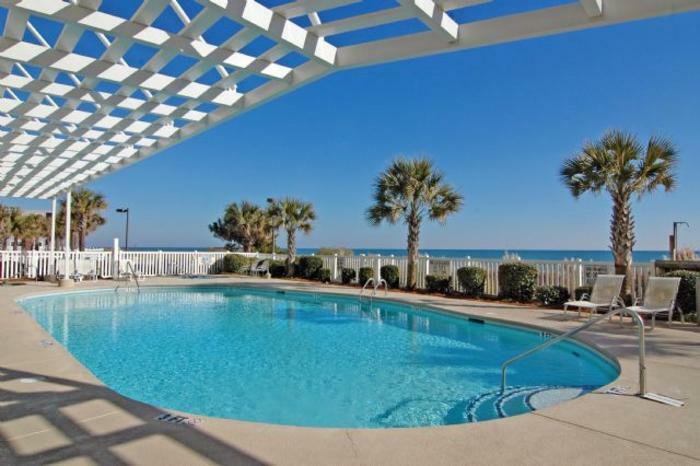 The amenities inside these North Myrtle Beach condominiums and outside on the pool decks are phenomenal. You can feel good about making reservations for your family vacation at Bluewater Keyes North Myrtle Beach resort. The largest of the two sun decks at Bluewater Keyes is on the oceanfront. Chaise lounge chairs are scattered throughout this welcoming pool deck so you can relax just feet from the swimming pool and still hear the sounds of nature on the beachfront: seagulls and crashing waves. This attractive pool deck has something for all ages. There is a hot tub at one end of this sun deck where jets, warm water and plenty of bubbles ease sore muscles and rejuvenate tired bodies. Next to this hot tub is a bright blue swimming pool. Whether you swim for exercise or slip into this pool for a refreshing dip on a hot summer day, this swimming pool has stellar views of the amazing Atlantic Ocean. Toddlers can safely swim in the kiddie pool made just for them. It is next to the big swimming pool and its water is shallow and suitable for the youngest members of your family. The lazy river is at the southernmost end of the oceanfront pool deck at this North Myrtle Beach resort and it twists and turns around a couple of palm trees. Grab an inner tube and lazily float down this river that requires absolutely no effort on your part. Kids and adults alike love the lazy river at Bluewater Keyes. From this oceanfront pool deck you can easily hop on out to the white sandy beaches. A wooden walkway leads Bluewater Keyes guests over the dunes and out to the beachfront for a day full of fun. Having two pool decks provides a one-of-a-kind experience at Bluewater Keyes because one pool deck is an ideal location from which you can watch an oceanfront sunrise. The other pool deck is on the west side of this North Myrtle Beach resort and is a nice place to hang out at the end of the day and watch the sunset. The pool deck that is on the sixth floor of Bluwater Keyes features a shallow-water kiddie pool and two hot tubs. This pool deck is closer to your North Myrtle Beach condominium at Bluewater Keyes and is a wonderful locale on site for relaxing with your family. Get ready to sweat during your North Myrtle Beach vacation at Bluewater Keyes. The fitness center has workout stations with adjustable weights. Run around the block or run for miles on the treadmill at Bluewater Villas. You can enjoy a full-body workout with all the equipment that is available for your use in the Bluewater Keyes oceanfront fitness center. Renew your body and soul at Bluewater Keyes with elegance that soothes your mind and amenities that make life easy during your North Myrtle Beach vacation. Some of the spacious North Myrtle Beach rentals at Bluewater Keyes have room for up to 12 people. Choose a two-bedroom North Myrtle Beach vacation rental with two baths or a three-bedroom North Myrtle Beach condominium with three baths. Both floor plans have a delightfully furnished kitchen that even includes a dishwasher. You will find a washer/dryer unit in each of these condos in North Myrtle Beach, SC, too. The high-speed Internet access is handy when you bring your laptop and the DVD players in each of these North Myrtle Beach rentals means you can watch your favorite movies during your pleasant stay at Bluewater Keyes. Indulge in the Jacuzzi tub that is part of the master suite of each North Myrtle Beach vacation rental. The North Myrtle Beach condominium rentals at Bluewater Keyes have ocean views. Some of these North Myrtle Beach condominiums are directly on the oceanfront while some have side views. From all of these beautifully furnished balconies you can see the mighty Atlantic Ocean and the white sandy beaches. Start your North Myrtle Beach vacation day on your private balcony with a cup of coffee. Go back out to your beautiful balcony in the evening hours and admire the nighttime landscape that includes moonlight and stars. Bluewater Keyes is a North Myrtle Beach resort where the floors with condominiums and penthouses are on top of the parking garage. This parking garage has five floors so there is plenty of parking at this oceanfront North Myrtle Beach resort. Elliott Beach Rentals is not affiliated with onsite management or the HOA of Bluewater Keyes.